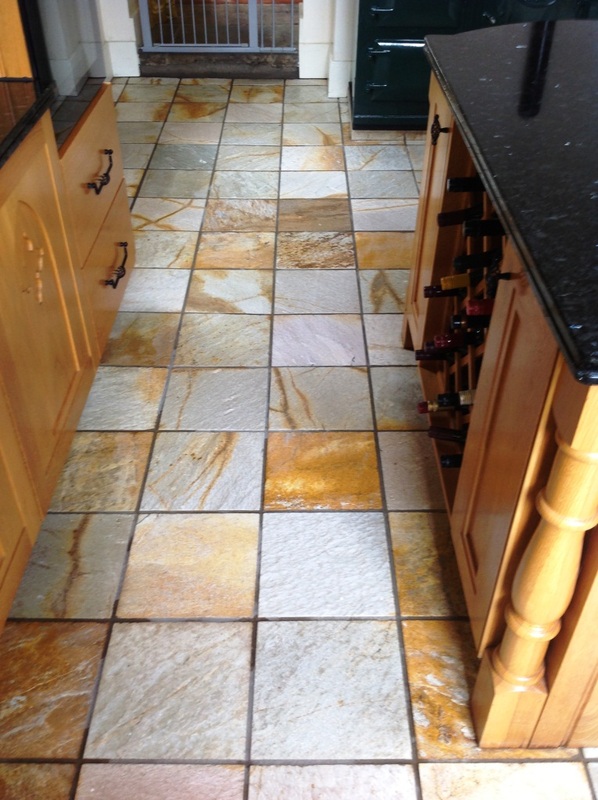 We were asked to come and advise a customer regarding their stone floor which the customer was struggling to keep clean. The property was in High Bentham which lies on the River Wenning, just West of the Yorkshire Dales National Park. 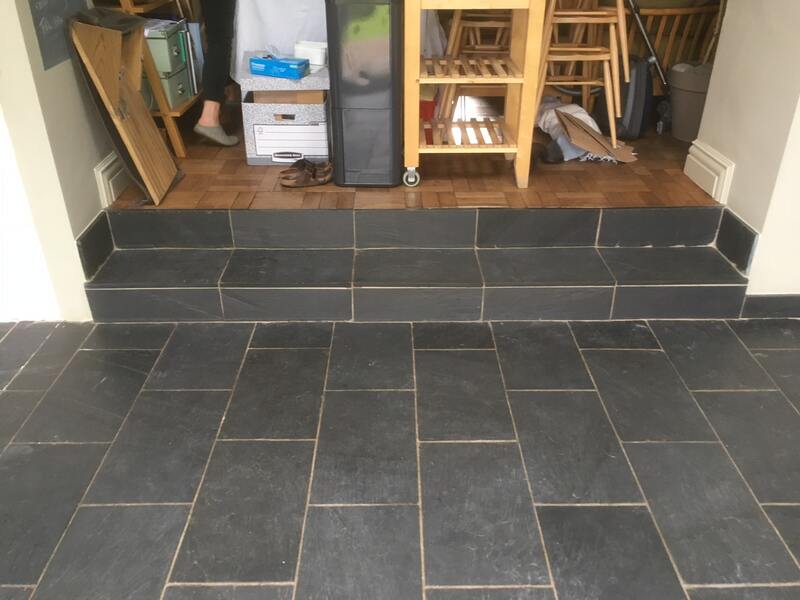 We often get customers who give up looking after their tiles after a while as some stone like this Black Riven Slate need quite a bit of upkeep to keep them looking good and a standard mop and bucket at times isn’t enough to keep them looking pristine. In this case the sealant had worn away in the high traffic areas and the floor had a slightly rough texture to the surface which meant it was holding onto dirt making it difficult to keep clean. We proposed the floor should be cleaned and resealed, discussed the cost and agreed a time for the work to be carried out. 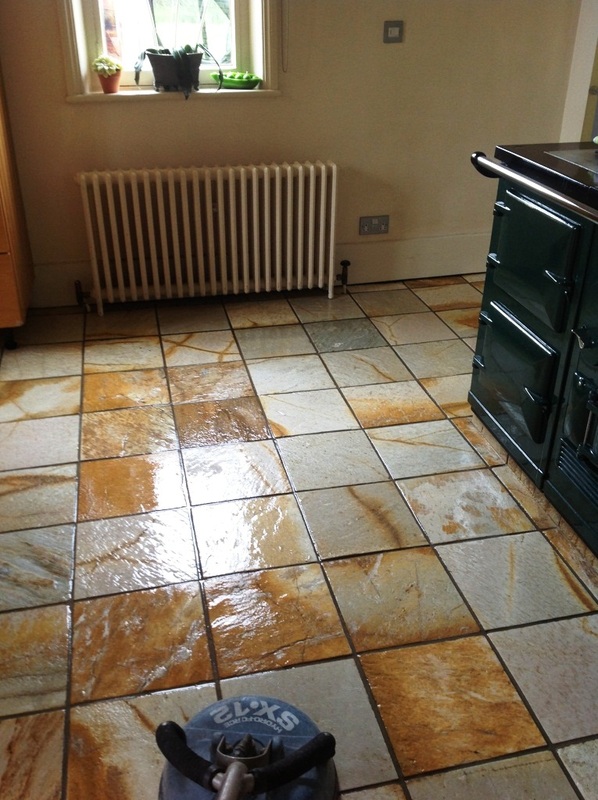 To get the tiles clean we burnished the stone floor with a coarse 200-Grit Diamond pad fitted to a weighted buffing machine using water for lubrication. 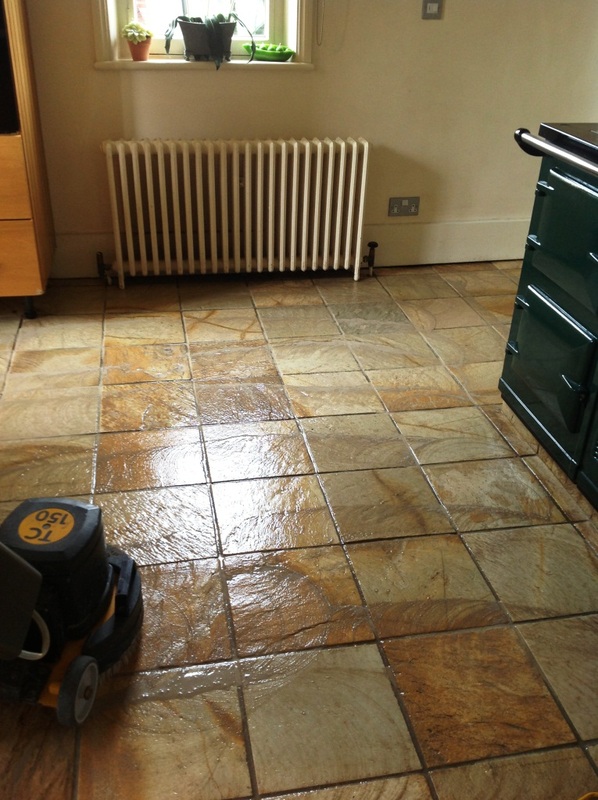 The floor was then rinsed and then the process repeated using a series of different graded pads, namely the 400 and 800 grit burnishing pads which further cleaned and resurface the appearance of the stone. The grout was cleaned using Tile Doctor Pro-Clean which was scrubbed into the grout lines by hand; Pro-Clean is a heavy-duty cleaner which gets to the really stubborn stains and it did a great job at getting the grout looking like it should. 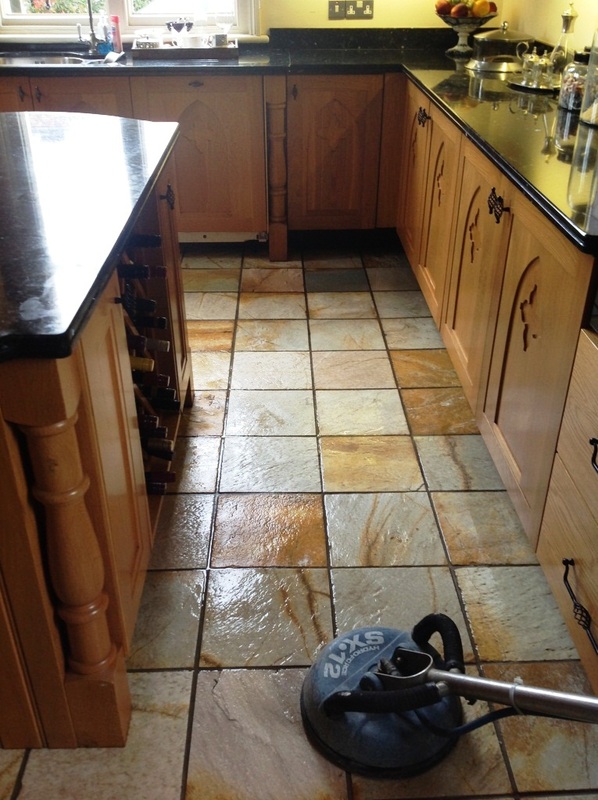 The cleaning process was then finished off by rinsing the floor with water and extracted the slurry with a wet vacuum. 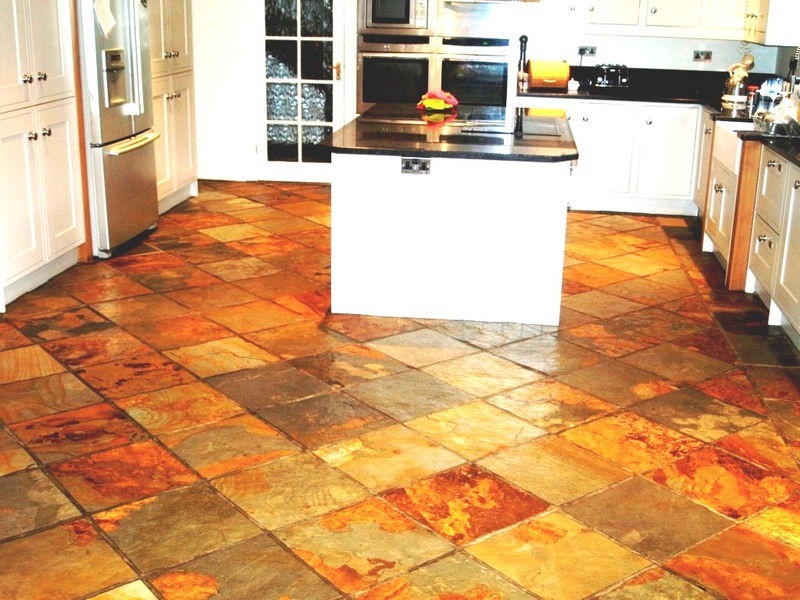 The floor was inspected and retreated to the same process where more work was required. 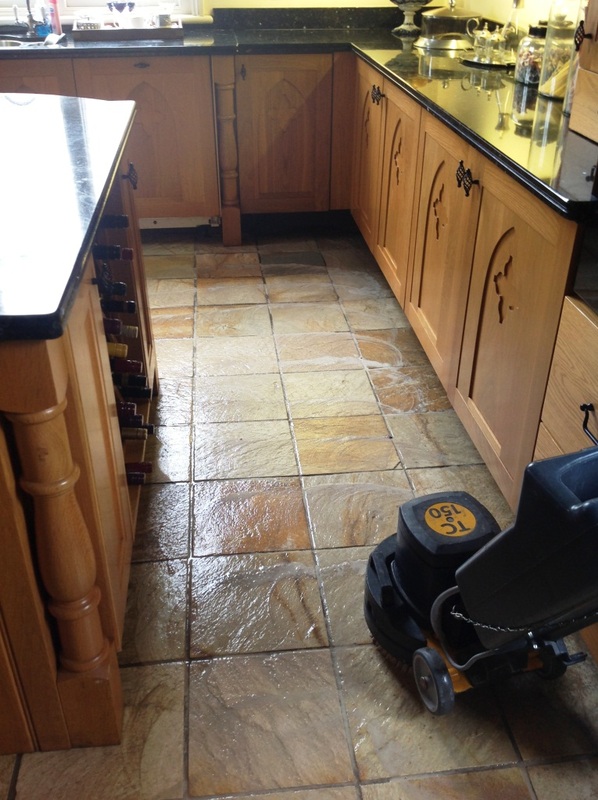 We usually find leaving Pro-Clean on a stain for longer and assisting with a bit of steam helps to lift the dirt out of the pores of the stone. Once cleaned thoroughly we rinsed the floor again and then extracted as much moisture from the floor as possible with a wet vacuum before leaving it to dry off fully overnight. 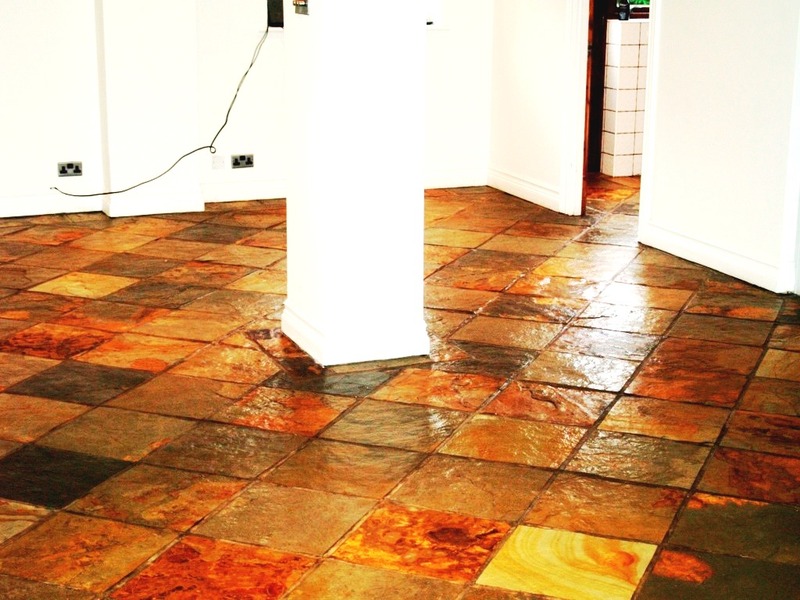 We called back the following day to apply a sealer first checking the floor was dry using a moisture meter. All was well, so we started to apply the first of two coats of Tile Doctor Colour Grow, a third coat was attempted but the slate would not accept any more sealer, and this was removed with a cloth. It is important to know if you have reached FCS (Full Cure Sealability) if not then the pores of the tiles will still be open to accepting dirt and the job won’t last long. Over a very short period of time the tiles will diminish in stature and finish. 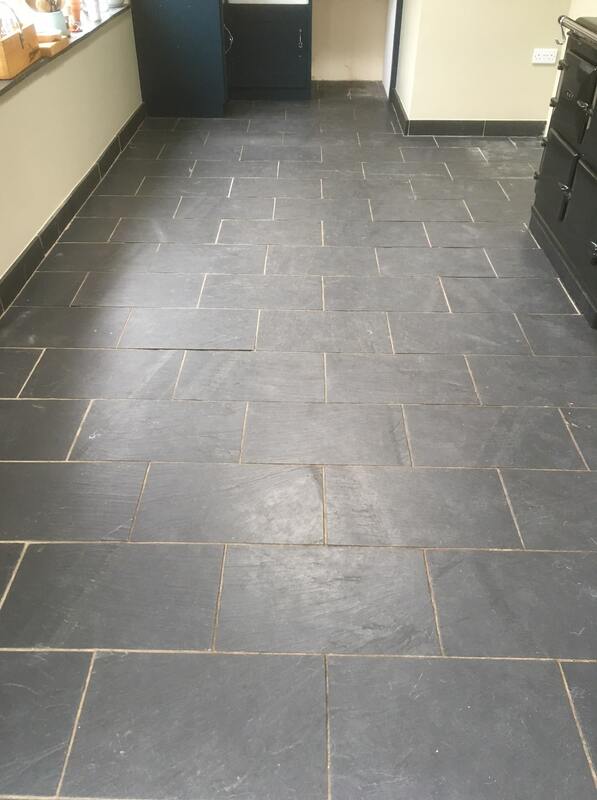 The sealer really restored the black colour to the Slate and transformed the look of the floor. 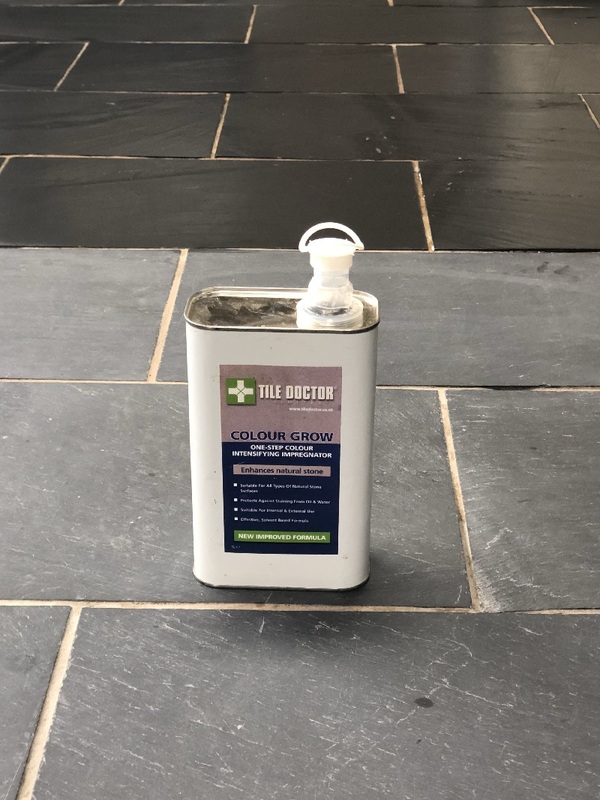 As always, we left the customer a free bottle of Tile Doctor Neutral Cleaner, using the correct cleaning product in future will ensure they get maximum life out of the sealer. 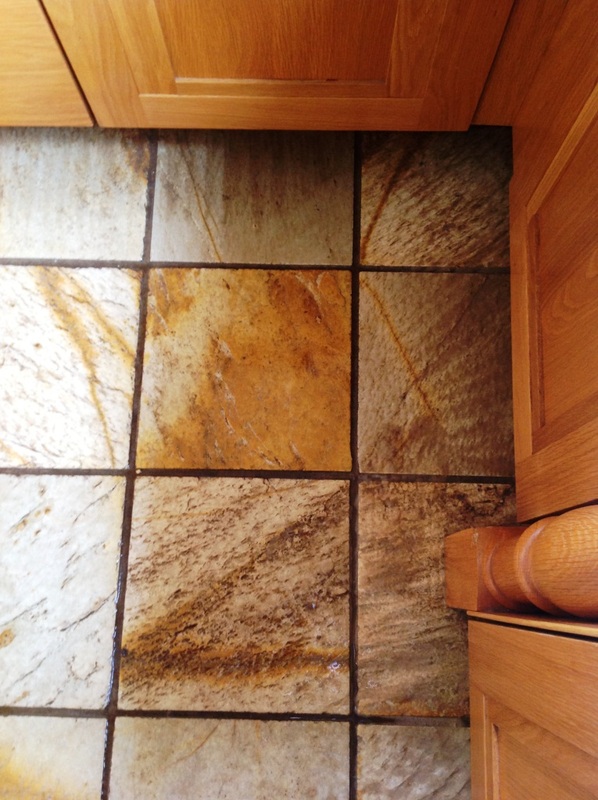 The floor looked lovely when finished and the customer was very happy with the overall result. 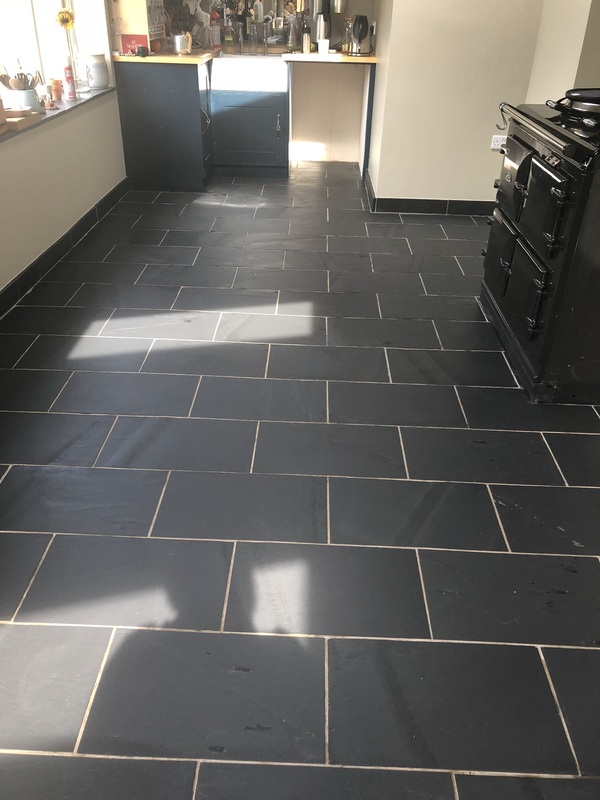 This customer from Chelwood Gate which is a small village south of East Grinstead contacted me asking for the Slate tiles in their kitchen, utility room and living area to be cleaned and sealed. It was quite a large area, approximately 70sq meters. Once we had cleared the large sofas and fridge freezer from the room I got to work cleaning and stripping the floor using a strong dilution of Tile Doctor Pro-Clean. I was slightly concerned by the large ridges on the tiles but made a start with the buffer fitted with a black scrubbing pad. Straight away the pad was shredded on the ridges so it became clear the floor would have to be completed manually using a deck brush and elbow grease. Once the floor was clean and stripped of any remaining sealer I gave it a thorough wash down to remove any cleaning product and extracted as much water as possible with a wet vacuum Luckily the room was well ventilated with several exits and large doors which aided the drying process. After two days I returned to a dried out floor which was ready for sealing. 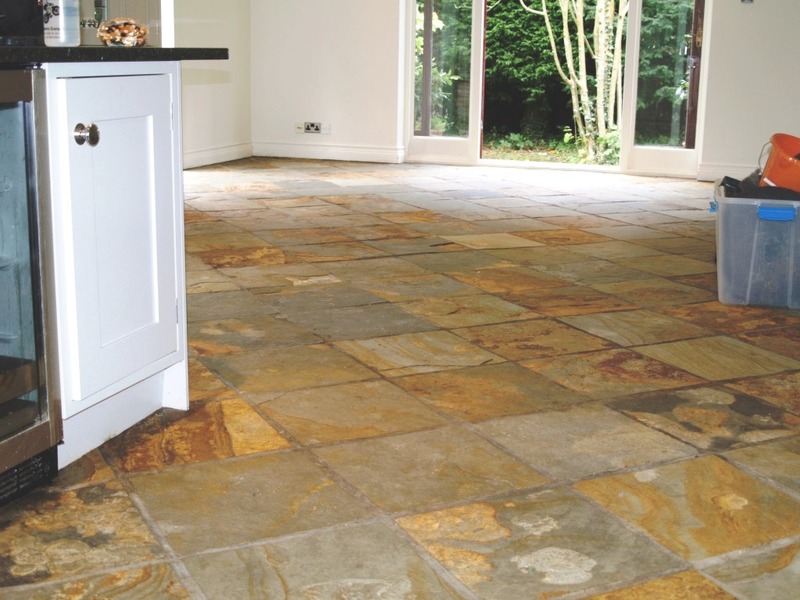 We have a number of different sealers available; each one has a different effect. After discussing this with the customer they requested a shiny surface with improved colouring, so for the next five hours I applied four coats of Tile Doctor Seal and Go which is a water based sealer that gives a nice shine which matched their needs. You can see from the pictures the difference and amazing before and after result. We were unable to move one of the freezers in the utility room so I left the customer with a small bottle of Seal and Go to apply himself once the floor had dried enough to move the unit without scratching the sealer. These photographs are from that lovely old period property in the village of Harston near Cambridge, you may recall an earlier post where I worked on the Victorian Tiled hallway. 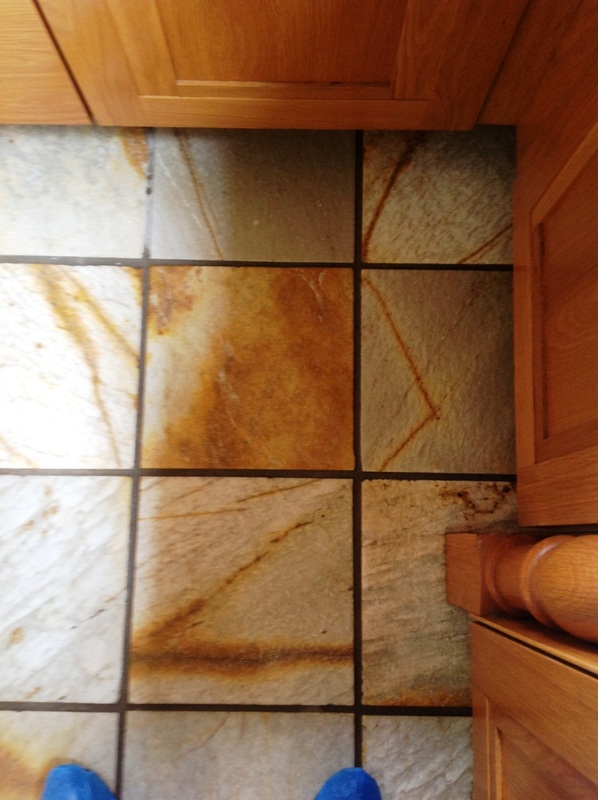 These photographs are from the Slate Tiled Kitchen floor which they asked me to clean and re-seal as well. The process for cleaning and sealing slate is very similar to Victorian and Quarry tiles so this was as they say a bread and butter job for a Tile Doctor. The beauty of working in a kitchen is I was able to remove the kick boards instead of having to protect the skirting boards with tape. 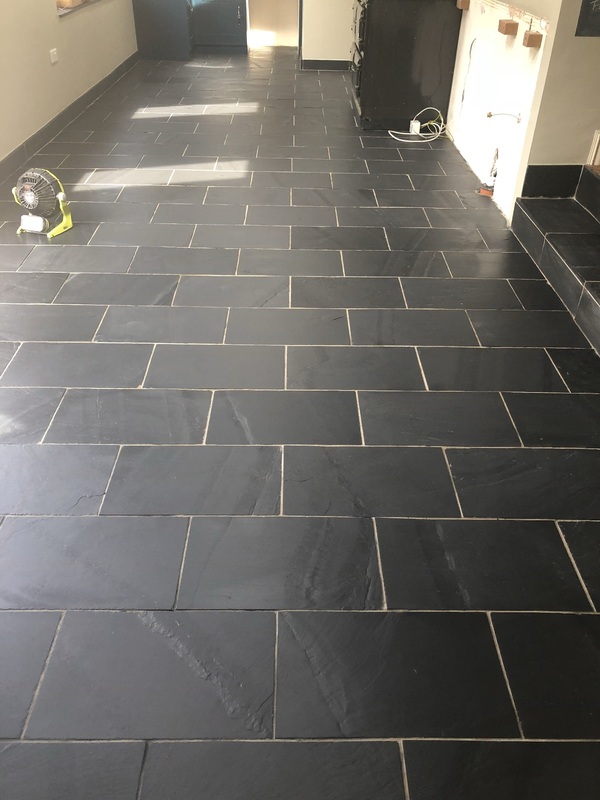 Once the preparation was done a dilution of Tile Doctor Pro-Clean was applied and left to soak into the Slate tile for a while before being worked in using a rotary machine fitted with a black scrubbing pad. 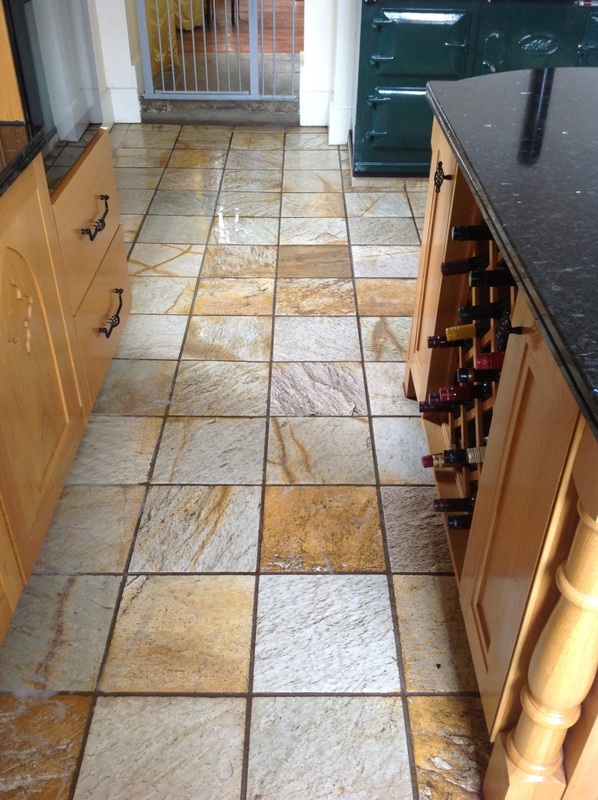 Pro-Clean by the way is an alkaline cleaner so it’s safe to use on tile and stone unlike some acidic products which will cause damage over time. As before I re-applied Pro-Clean on any stubborn stains and also gave the grout lines a good scrub with a stiff hand brush to make sure they were clean. 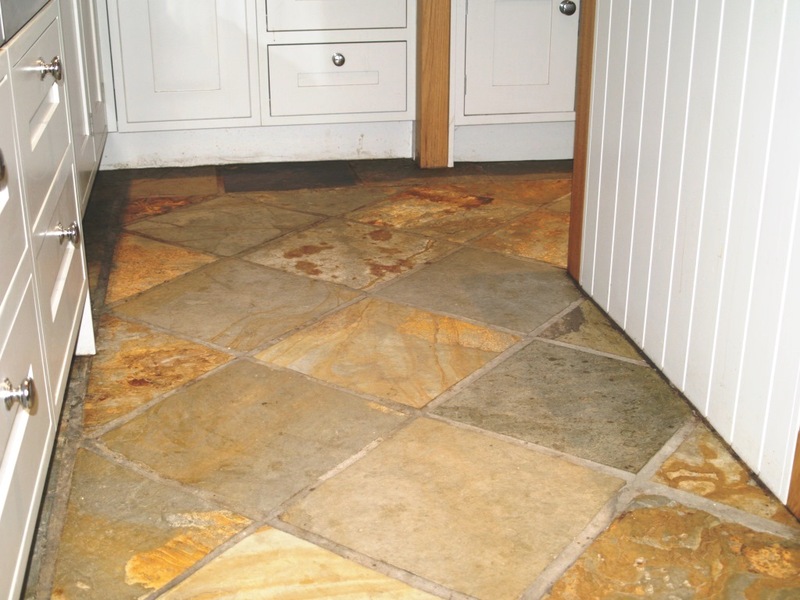 Once happy with the general condition of the tile it was time to use the spinner tool which applies hot water under pressure effectively rinsing the floor whilst removing the water at the same time with suction. This does a great job of rinsing the floor and removing any trace of cleaning product before sealing, this is important to ensure a good finish when sealing. 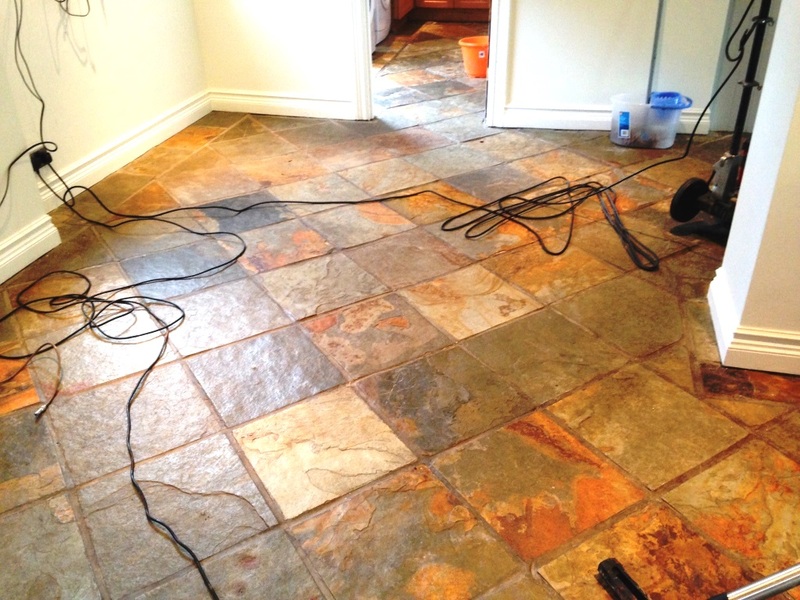 The spinner tool does a good job of removing liquids from floors however the tile was still damp so it was left to dry assisted with air blowers until dry. Now normally I would use Tile Doctor Seal and Go to seal slate tile however the customer wanted a matt finish for this surface so it was sealed using two coats of Tile Doctor Ultra Seal which provides a more natural look it’s also recommended for use in food preparation areas.